RJs of Radio Udaan Making News! In this post, we can go through different article contents related to different Rjs. The purpose of this post is to share with our listeners the articles revolving around our RJs published in different newspapers / magazines .. Some of the content is in text while the rest is in Graphic format. Happy Exploring! Shyaam Sharma and Gitesh Gehlot belong to a team of 19 visually-challenged radio jockeys associated with Udaan. Two visually impaired youngsters in Indore who double up as radio jockeys while holding regular jobs in banks have blended a perfect balance to realise their dream of making a difference in the lives of people like them. 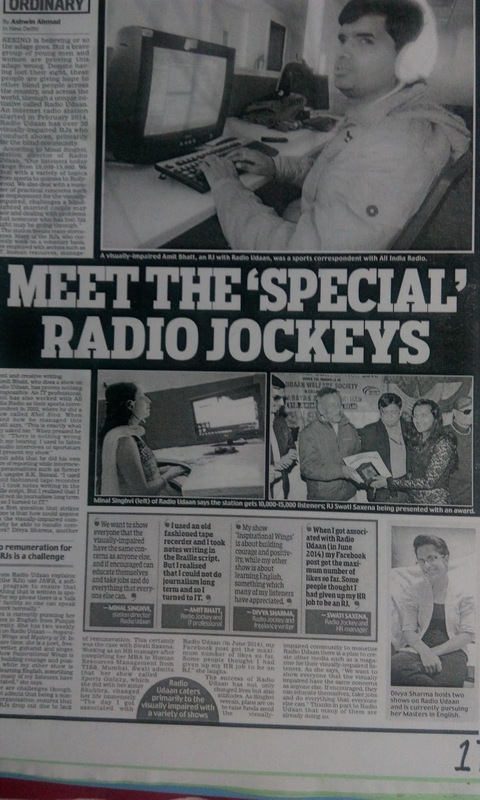 Shyaam Sharma and Gitesh Gehlot belong to a team of 19 visually-challenged radio jockeys associated with Udaan. They said they got the idea of starting a dedicated radio station for blind people to teach them about new electronic gadgets and computer software. “We have an entire network of people who are visually impaired and we chat with each other on WhatsApp and Skype and that is how the concept of starting a dedicated radio programme came and we decided to volunteer and do our bit,” says Sharma. The reason behind the radio station was to help blind people, says Sharma, the technical brain behind the initiative. “I started taking session on radio and explained to the listeners how to operate a gadget or software. My aim was to help blind people like me to become independent,” he says. “I decided to work as a part-time radio jockey for an educational program while continuing with my job at the bank,” says Sharma, who compares a programme called Tech-city. Gitesh Gehlot, who conducts a 20-20 quiz programme on the radio talk-shows, says the programme gives students an opportunity to prepare themselves for competitive exams. “In my programme I ask students questions related to bank, UPSC exams and other competitive exams,” he says. The duo want the government to allot them a radio frequency for the station as it will be a boon for the visually impaired people. “Not everyone can afford a good internet connection or even a device that connects them to the web. By shifting us to a normal frequency even youngsters who are not financially well-off, can listen to our programmes and learn things,” says Sharma. ‘A flight of life’, as Radio Udaan calls itself, is a unique community-based radio station, which provides both its listeners and RJs an opportunity to be inspired and empowered. The Journalism students at SIMC were allowed an insight into the same, when RJ Danish Mahajan, one of the creators of Udaan, agreed to be interviewed by the former via Skype. Talking about his childhood and how he lost his eyesight in 2002 at age 14, RJ Danish expressed, “I had no idea, at all, that even a blind man could study as I came from a remote village. It was only later that I went to study in a school in Ludhiana. There however, I realized there are many challenges faced by the visually impaired people. I observed that while media covered all other issues, matters related to disabled people were being ignored”. Now, an inspiration to thousands, he constitutes a valuable part of Radio Udaan while also working at a state government office in Pathankot. Born out of the desire to communicate and reach out to the visually impaired, Udaan brings together “geographically isolated” individuals to form an inclusive world which is devoid of stereotypes. He explains how Udaan took off through the Internet, becoming a one of a kind, special interest radio station. “This was going to be a radio for the blind, by the blind, through which the community would reach out to others as well”, said an article commemorating the Udaan’s six-month anniversary. With ‘Braille Day’approaching on January 4, RJ Danish says Udaan is, “going to have a special transmission where listeners can join us and share their views. We will discuss the Braille system and how it benefits the blind. Apart from this, we will also air a movie on Louis Braille on that day, which is made by our fellow organization which is working for the blind community. This of course, after taking their permission. All our team members and RJs will make the people around them aware of Braille”. technology and its efficient use by people like him, visually-impaired. application on the name of their radio channel. “These people are not dependent on any one as they fund the programme. various subjects for ‘Divyang’ people. New Delhi and many of them are working for the banks. The station breaks many stereotypes. Many of the RJs, who currently work on a voluntary basis, are employed with sectors such as IT, human resources, management and creative writing. Seeing is believing or so the adage goes. But a brave group of young men and women are proving this adage wrong. Despite having lost their sight, these people are giving hope to other blind people across the country, and across the world, through a unique initiative called Radio Udaan. An internet radio station started in February 2014, Radio Udaan has over 30 visually-impaired RJs who conduct shows, primarily for the blind community. Divya is currently pursuing her Masters in English from Punjab University. She has two weekly shows on Radio Udaan – Inspirational Wings and Mystery of 26. In her spare time, she is a poet, freelance writer, guitarist and singer. “My show Inspirational Wings is about building courage and positivity, while my other show is about learning English, something which many of my listeners have appreciated,” she says. There are challenges though. Singhvi admits that being a nonprofit organisation ensures that some RJs drop out due to lack of remuneration. This certainly was the case with Swati Saxena. Working as an HR manager after completing her MBA in Human Resources Management from TISS, Mumbai, Swati admits that her show called Sports Galaxy, which she did with her sister Shubhra, changed her life immensely. “The day I got associated with Radio Udaan (in June 2014), my Facebook post got the maximum number of likes so far. Some people thought I had given up my HR job to be an RJ,” she laughs. The success of Radio Udaan has not only changed lives but also attitudes. As Singhvi reveals, plans are on to raise funds amid the visuallyimpaired community to monetise Radio Udaan there is a plan to create other media such as a magazine for their visually-impaired listeners. As she says, “We want to show everyone that the visually impaired have the same concerns as anyone else. If encouraged, they can educate themselves, take jobs and do everything that everyone else can.” Thanks in part to Radio Udaan that many of them are already doing so. Radio Udaan is looking for empowerment, companionship, entertainment and jobs — not sympathy. for the blind, manned exclusively by the blind. going. Now, Udaan is looking to generate revenue from ads to facilitate expansion of its operations. Udaan on the go — on mobile phones, tablets, PCs, laptops, etc. Programmes are broadcast in English and Hindi. preparing for competitive exams, etc. But perhaps, more important is another purpose served by Udaan — as a helpline, counsellor and…..
Radio Udaan, internet radio channels run by visually impaired, completed two years. A Radio Udaan Convention was held to mark the occasion at Braille Bhawan, Jamalpur. Produced and thoroughly managed by persons with visual challenges, Radio Udaan is listened across 100 countries and by more than 20,000 listeners per month. The full processing of Radio Udaan such as web designing, show hosting, and so on are completely governed by the visually-challenged members. Danish Mahajan, general secretary from Pathankot, said it was a national-level convention that saw participants from across the country coming to the city. “The last convention was held in Delhi. It was an awareness event to showcase that visually impaired persons should not be looked at with negative attitude, as they are equally able and part of the mainstream society,” he said. At present Radio Udaan has six executive members and 25 RJs. As many as 300 visually impaired persons were part of the convention. Several events, including paper presentations on motivation and Persons with Disabilities Act 1995 were organised. Play on “Visually Challenged and the Matrimonial”, people-to-people interaction, game show, cultural events were also held. Many More to Come Soon! Radio Jockeys are basically those whom you hear anchoring various types of programs, mostly music, on the radios.